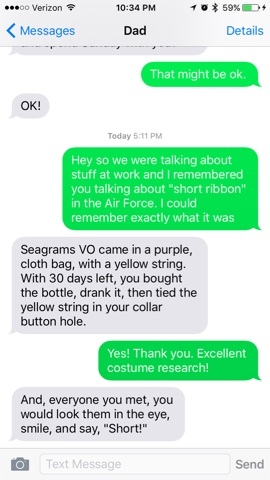 The Costumers Collective Blog shares my adventures in the professional and educational entertainment costume business, as well as tips, tricks, and information about new techniques and products I've discovered. Guest bloggers share their experiences and expertise. Find out more about how things work in the world of costumes for theater, dance, musical theater, and more! I went forth on this blogging adventure with one idea, but I think it could be something more. What I will now begin to do is post about the costumes I am building and a bit about the process. May as well jump right in! Right now, I am working on a project for the play "The Rimers of Eldritch" by Landford Wilson. It takes place in a former coal mining town in the rural Midwest, 1966. 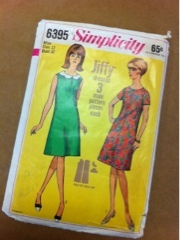 My costume shop is fortunate to have a large collection of commercial patterns going back to the 1940s. This is a great place to start, especially for a project like this where the character very likely would have made her own clothes. Unfortunately, the pattern I had was many sizes too small. Also, given the changing shapes of modern bodies, it was not exactly proportional to the actress I had to fit. But, I at least had the beginnings of the correct shapes to move forward. I traced the pattern and then added generous seam allowances. Cutting only the right half, I placed the pieces on the dress form (which I padded to be the same proportions of the actress) and re-draped the dress until it was in a state that it would both retain the period shape and also flatter the actress. Finally, I had to re-drape the collar so it would fit the new neckline and reflect the shape that the designer desired. This technique allowed me to save a lot of time and research. If I had begun from the beginning of the draping process, it would have taken me double the amount of time. Could I have done it that way? Yes. 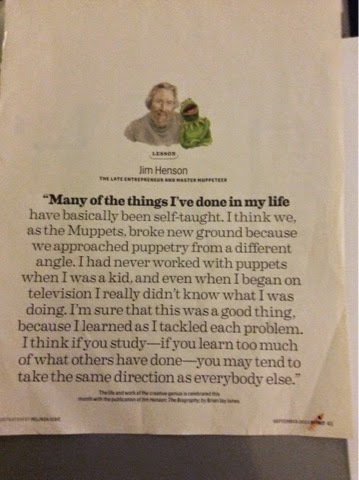 But beyond an exercise in ego, there was no need. Beautiful results could be made from a much more simple solution. Fittings Tuesday. 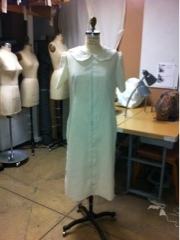 More to come on the development of this dress!